Since 2008 the Mackinac Center for Public Policy — and more recently in conjunction with the Washington, D.C.-based Tax Foundation — has worked to estimate the degree to which cigarettes are smuggled into and out of American states. Our research, and that of other scholars too, suggests that smuggling is a rampant problem, particularly in states with high cigarette excise taxes. Unintended and unforeseen consequences are a frequent problem in public policy. Few politicians realize when they vote for higher excise taxes that doing so may dramatically increase cigarette-related crime, such as smuggling. These crimes not only deprive local and state governments of tax revenues, they also tend to descend into violence, which produces all sorts of unnecessary damage. Policymakers should take these realities into consideration when contemplating how much to tax cigarettes. 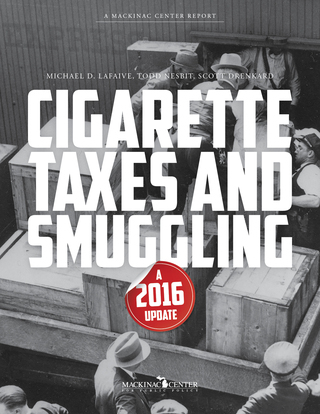 This report analyzes the relationship between cigarette tax rates and cigarette smuggling rates. It relies on the same statistical model used in our previous studies, but uses the latest available data from 2014. New York State once again claims the highest smuggling rate in the nation. In fact, according to our analysis, New Yorkers consume more smuggled cigarettes than they do legally taxed ones. New York state has the highest excise tax rate on cigarettes in the country at $4.35 per pack and New York City adds another $1.50 tax. Arizona, Washington state, New Mexico and Minnesota round out the top five states for percentage of in-bound smuggling. Michigan ranks 12th, down two positions.